In medium heatproof bowl, place chocolate chips. In 2-cup microwavable measuring cup, microwave whipping cream uncovered on High 1 minute or until hot; pour over chocolate chips and stir until smooth. Set aside 1 cup chocolate mixture for dipping strawberries. Frost cupcakes with remaining chocolate mixture. Dip strawberries, one at a time, halfway into reserved chocolate mixture. 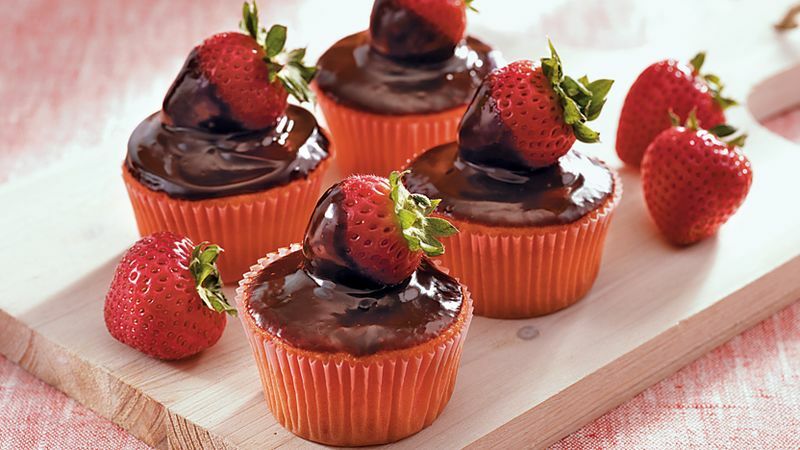 Garnish each cupcake with dipped strawberry.